Almost 3 years ago, I asked y'all to help me with the name of a flower that suddenly popped up in my yard. 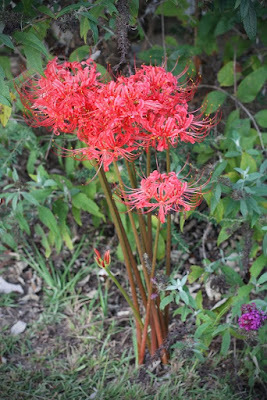 Tammy was smart enough to google it and found out that it was a Spider Lily!! I never planted any of these, but one just suddenly popped up in 2006!! Lo and behold, y'all! It's happened again!! The Spider Lily wasn't here in 2007 or 2008 but this year it not only popped up again, but it brought friends!!!! Look!!!! I've heard of bi-annual flowers....but tri-annual?!?! May depend on the zone you're in I guess. I'm excited to see what is left of my yard this year. Time to track those fall annuals and plant more bulbs for spring! That's beautiful! Did it maybe grow last year, but not flower? I have some bulbs that do that occasionally. Thanks for sharing the picture - it is so pretty! That is SO NEAT! :-) You know, the only reason I knew what to google in the first place was because I was currently taking a gardening course at the local nursery. I have enjoyed looking around your blog. I will for sure come back. Fun posts. Those are the best kind of surprises! !